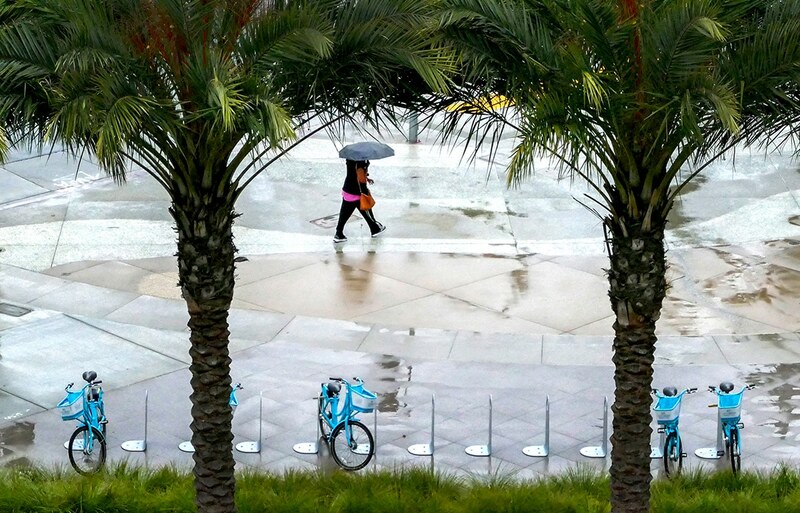 A woman takes cover under an umbrella as she walks downtown Long Beach after a slight downpour in Long Beach October 3, 2018. After a wet weekend that brought close to an inch of rain in Long Beach, another storm is expected to arrive mid-week and a more powerful storm may come ahead of the weekend, forecasters say. Monday’s rain was the result of a second Pacific storm after a system that hit Sunday, said National Weather Service meteorologist Curt Kaplan. Long Beach has so far received 4.43 inches of rain since Oct. 1, the beginning of the rain year. That is 108 percent of normal for this time of year. By comparison, last year the city had only received .07 inches of rain by Jan. 6. The next storm—one of several lined up in the Northern Pacific and riding the jet stream to the Southland, according to Kaplan—is expected Wednesday, but the lion’s share of the precipitation likely will remain north of L.A. County, he said. A storm much more likely to strike L.A. County is expected on Friday. If you’re traveling near up the coast, the coming storms are also expected to generate a very large west swell by Tuesday night. The swell is expected to produce an extended period of high surf along west- and northwest-facing beaches (Long Beach has a south-facing beach). The surf on Tuesday night into Thursday will be particularly high with breakers of 17-22 feet. Staff contributed to this report.